Spring is in the air and I am so happy to finally see it here. It seems like this has been the longest winter for us even though we did not have the mounds of snow and sub-zero temps that many of you had. 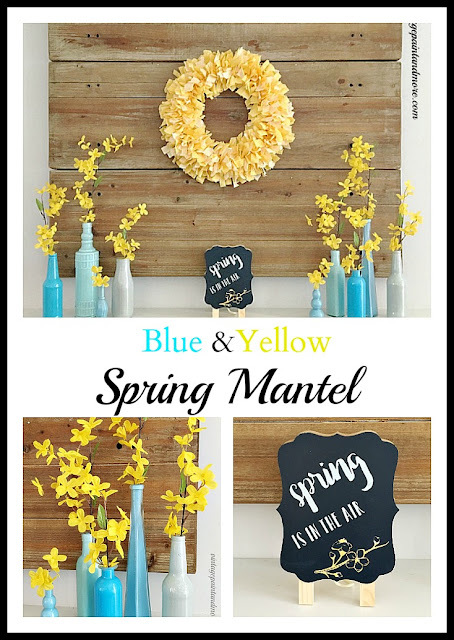 So, to celebrate this I put together a pretty blue and yellow Spring Mantel. I love how it brings so much color and cheerfulness to this room. Next are the bottles that hold the faux forsythia stems. I simply used 4 different colors of craft paint to paint these bottles. It's a very simple project that I did using bottles I had saved and picked up at the dollar store. You can find the instructions to do these here. I placed five bottles on the right side of the mantel and four on the left. I like doing things unevenly. It gives the mantel more interest. A picture of the bottles on the left side of the mantel. I am absolutely loving these blue colors and how these bottles all turned out. In the center of the mantel is a little chalkboard easel that I made with the new Chalk Couture chalk pastes I shared with you last week. I found the little easel at the Target Dollar Spot a couple years ago and just erase it and reuse it for different areas of our home. 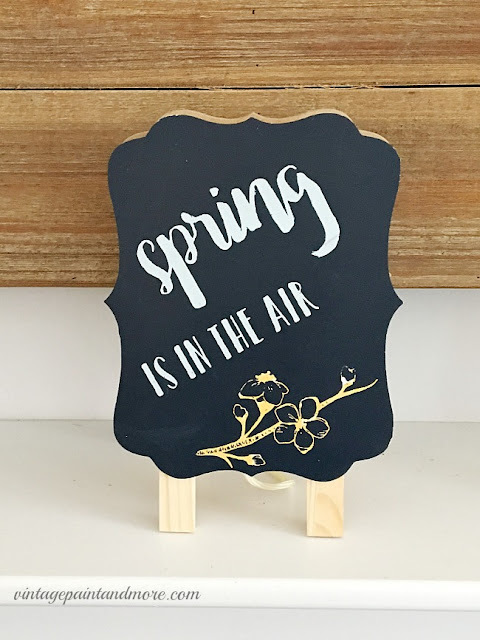 And now, with the easy Chalk Couture process, I can have perfectly made chalkboards that take just minutes instead of hours to make. This is such an easy way to make beautiful and interesting chalkboards and everyone turns out perfectly. I love using this and you will be seeing a lot more of it here in the future. So, here is our cheery Spring Mantel in my favorite colors. I love coming into the room and seeing it - it brings a smile each and every time. Has Spring arrived in your home yet or are you still in the throws of winter temps and snow? I love hearing from you so tell me about it in the comments below. If you want to make sure you don't miss out on any of the latest great projects here sign up for my weekly email in the bar at the top of the page. Until next time enjoy making something you love. I will be linking up to the parties listed on the Where I Party page. 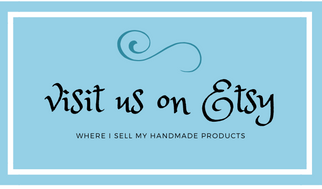 Please go by and check them out as you'll find all kinds of great projects and inspiration. I will definitely try to make that wreath! Thank you for the tutorial! Yellow always brings me energy. You are so welcome Teresa. Would love to see it when you finish. Saw this on the Spring and Easter Blog Hop. I have never liked yellow. It's because growing up my mother had a yellow and white kitchen in all 6 houses. UGH. But seeing your mantel has changed my mind. Not all yellow is bad! I just got some blue bottles so I guess it's back to Hobby Lobby for some yellow stems! Thanks for the inspiration. Happy Easter! I'm so glad you like it - yellow is actually one of my favorite Spring colors - it's just so cheerful. And, I love pairing it with blue. Hope you enjoy it as much as I do. Visiting from healthymotivatedlife.com (via Friday at the Fire Station)... Beautiful mantle!! 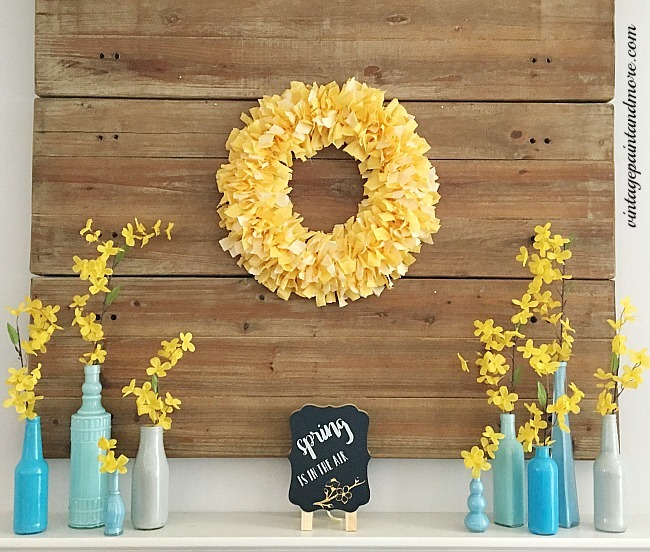 I’ve always loved the combination of blues and yellows and your mantle screams springtime. Thank you for sharing! Thank you so much Amanda. Blue and yellow are my favorite for Spring. Cathy, I love these colors together and your mantel is lovely! 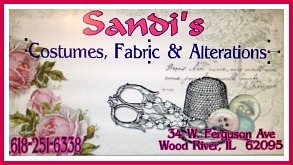 Glad you stopped by to share at the Spring & Easter Joys link party! Have a blessed Easter weekend! Thank you so much and thank you for stopping by. Wishing you a wonderful Easter weekend also. Hi Cathy, nice to meet you! I am so into yellow this spring! I am loving your wreath and mantel! I would like to invite you to link up this post over at the Spring and Easter Joys link party which is going on all weekend. You can link up to 5 spring and Easter posts. Hope to see you there! Nice to meet you also Amber. Yellow is one of my favorite colors for Spring. Thank you for the invite. Simplicity as it's best, the color combination is lovely. Thank you Ann. I love blue and yellow together. What a beautiful color pairing. I adore the wreath. Thank you so very much for linking to the Spring and Easter Joys party. Have a very Happy Easter! 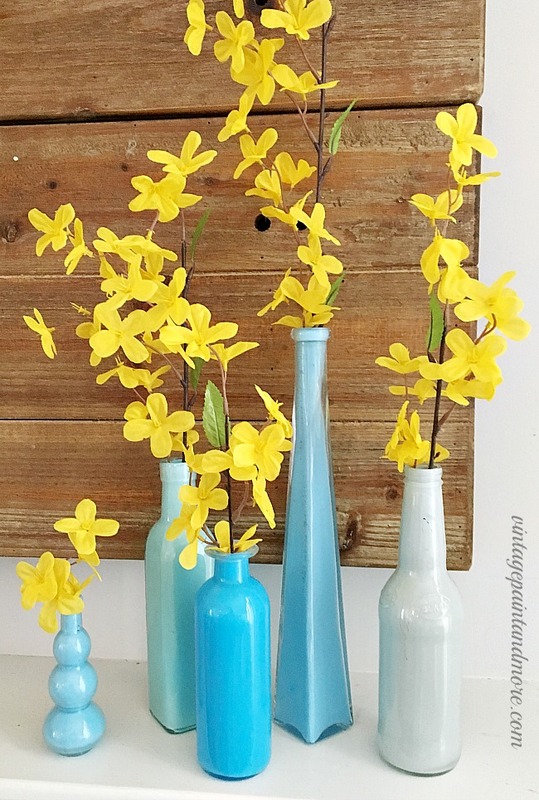 Thank you - blue and yellow are one of my favorite color combinations - especially for Spring. Cathy, it is so cheery and perfect for Spring! I love the blue and yellow combo. Thanks for sharing with SYC. Thank you, Jann. I love how cheery this combination is. Thank you for hosting each week. 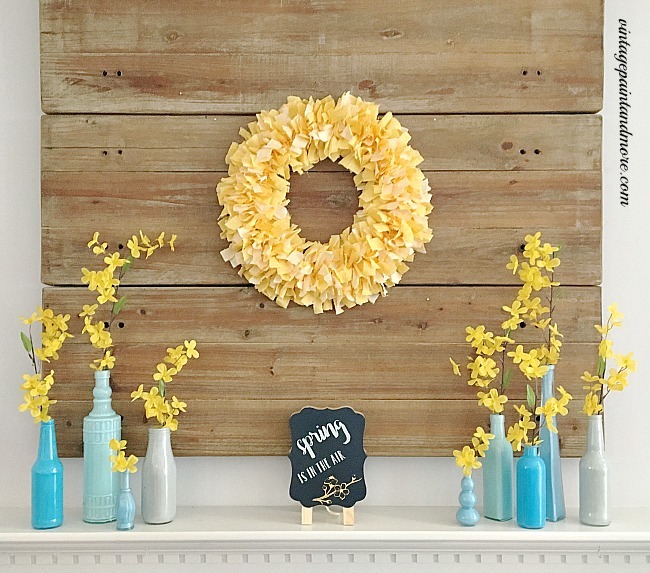 I love how pretty your mantel looks for spring. Thanks for sharing at Cooking and Crafting with J & J. Thank you, Julie and thank you for hosting each week. This is such a pretty mantel! The colors are so bright and springy!! Hi Cathy thanks for linking up at Thursday Favorite Things! I have featured you today at the party. I hope you will come back over and link up again. Happy spring! Beautiful and love that wreath! Featuring when my link party opens up tonight! 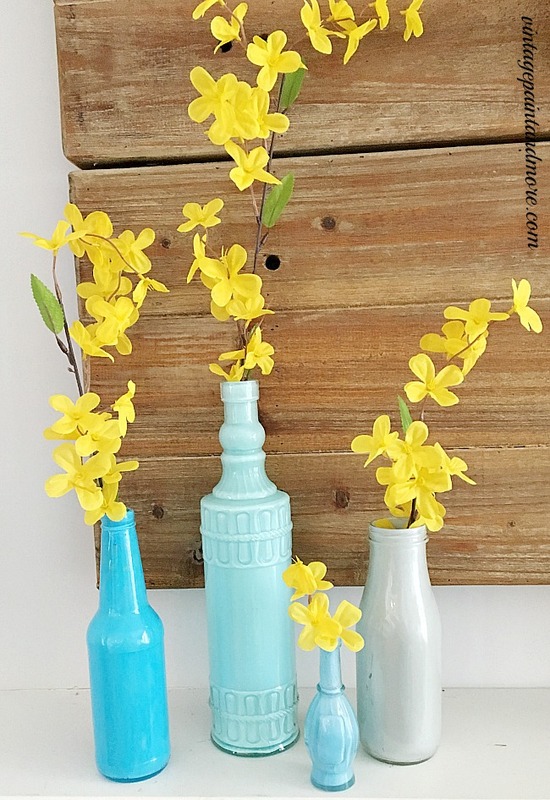 Loved your fresh blue and yellow combo set against the rustic wood! You'll be one of my features tomorrow for the Spring and Easter Joys link party. Thanks for linking up! I love these beautiful colors you used in your mantel. So bright and pretty for spring! You will be the featured post on this weeks Friday at the Fire Station link up! It's time for me to round up all those bottles I have stashed away. Love your mantel and I just styled a tablescape using the same colors. Thank you for sharing with us at Celebrate Your Story and have a great weekend. 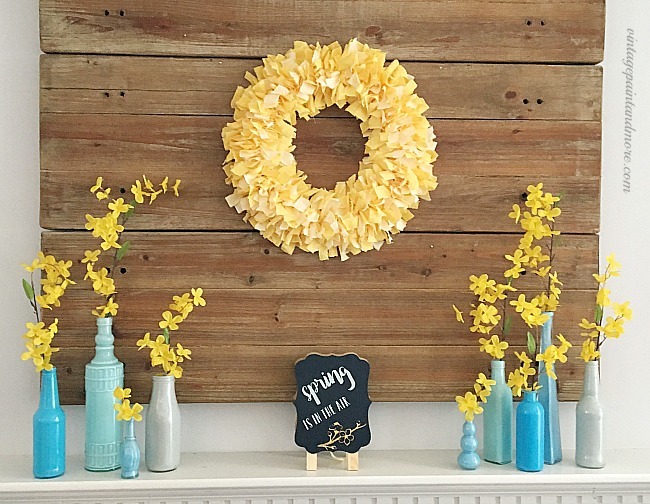 Your ideas for the mantel are perfect for spring!